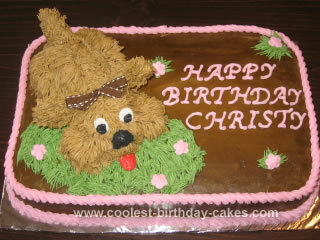 This dog cake is one of the most fun cakes I’ve made! I made this for my daughter’s second birthday. 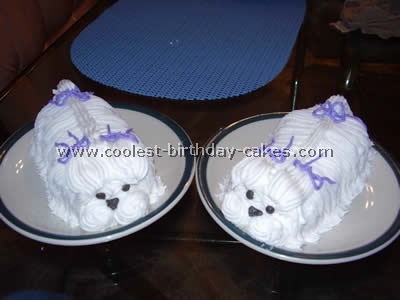 I actually combined several ideas that I found here on coolest birthday cakes. For the base, I used a 9×13. To get a cake as tall as I like, I usually use 1 1/2 recipes of cake (or 1 1/2 box mixes if you don’t want to make it from scratch). I always grease my pan, cut wax paper or parchment paper to fit the bottom, grease the paper, and then lightly flour the pan. This ensures that the cake will come out nicely. After it has cooled a bit and before flipping it out, I take a large bread knife and cut the top level with the pan. I took the scraps and stacked them together while still a little warm, so they were a bit sticky. Then I put the stack in the freezer to get hard. After it had hardened enough to not fall apart while I was carving it, I cut the shape of the body. Then quickly transferred it to the frosted base. The tail and ears, I made out of cardboard and covered it in tinfoil and just stuck into the cake. I used Wilton tip# 233 for the fur, it did take a bit to get the hang of it, and I had to really be careful to get it to stick to the cardboard. I used that same tip for the grass. For the eyes, nose, and tongue, I used butter cream and made them on waxed paper and stuck them in the freezer to harden a bit. If I make a cake like this again, I would do this part differently. I should have planned ahead and made them out of royal icing which hardens. Since they were frozen and red and black require a LOT of dye, as they thawed, they bled a bit – if you look closely at the nose, you can see what I am talking about. I thought it needed a little something extra, and just used regular ribbon to tie a bow and used a bit of frosting to attach it. Overall, I was pleased with how it turned out! This cake is wonderful! I love to expression of the puppy! great job.